Supports Windows 10/8.1/8/7/2000/Vista/XP/MAC OS X 10.4-10.14. 1. Not recommended for Linux users, it does not work for smart tv and xbox one...Windows 10 plug and play system or with drivers that can be obtained from the seller's website. 2. You must have a dual band WiFi router with 5G band if you want to have a 5G signal. 4. If your computer is desktop, special attention should be paid that the usb must be inserted behind the chassis of the desktop. The USB interface on the front of the chassis is prone to power supply instability and causes the network card to be damaged. 5. This WiFi adapter will not boost the speed of original router, it just transmit the wifi signal. 6. If your WiFi adapter is closed to the router, and you want to have fast speed in watching video and playing online games, we suggest that you should connect to the 5G band. If your WiFi adapter is far away from the router, and you just want to surf the website, you'd better connect to 2.4G band for better and stable signal. ♥ [Compatible system]: the wireless USB adapter is compatible with Windows 10 / 8.1 / 8/7, XP / Vista, Win 2000, MAC OS 10.4-10.14, (NOTE: it is not suitable for Smart TV and xbox, it is not recommended for Linux users), Windows 10 is plug & play. 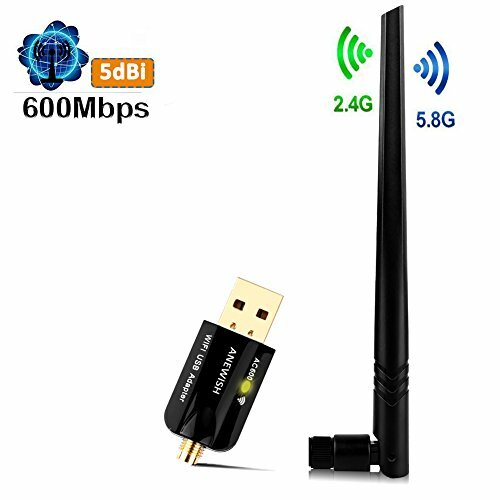 ♥ [WIFi USB 802.11ac] 5dbi usb wifi antenna adopts the latest and most powerful 802.11ac Wi-Fi technology, 3 times faster than wireless speeds. Compatible with 802.11 a / b / g / n wireless standards. ♥ [2.4 & 5.8G Dual Band] 5.8GHz stands out at short range. If the dongle is close to your router, there will be a stronger signal at 5.8 GHz than at 2.4 GHz; If the distance is long, you will have a better signal when you choose the 2.4 GHz band. ♥ [Warranty Service] We offer a 18 month warranty service. If you have any problem with usb wifi adapter, please contact us anewish2018@hotmail.com, we must help you solve it. If you have any questions about this product by A-NEWISH, contact us by completing and submitting the form below. If you are looking for a specif part number, please include it with your message.